Send to your dear ones, auspicious Raksha Bandhan wishes with this Irresistible Haldiram's Assorted Sweets Teamed with a Choco Pie Box that comes along with a free Rakhi, Roli Tilak and Chawal. The Haldiram Sweet Pack has a weight of 250 gms. 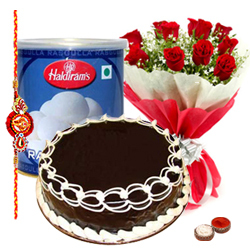 In case of unavailability of items at Haldiram, we provide it from another top quality sweet shop.